POLITICAL TIDBITS: President Duterte’s harsh shaming campaign against alleged “corrupt” officials in his administration would make some nominees understandably hesitant to accept posts, but his quick move to absolve Sol-Gen Calida in the multi-million deals his family security agency bagged from government firms is regarded as double standard. President Duterte’s harsh shaming campaign against alleged “corrupt” officials in his administration would make some nominees understandably hesitant to accept posts, but his quick move to absolve Sol-Gen Calida in the multi-million deals his family security agency bagged from government firms is regarded as double standard. President Duterte has come down hard on a few of his officials whom he had castigated for alleged graft and corruption. Before firing them he shamed them publicly, cursing them. I laud the President’s efforts to clean up his administration---no President has tackled this problem as forcibly as he has---but I cannot help but feel very sad for the families of those officials whom he had lambasted with some very harsh cuss words over nationwide television. I imagine that given the terrible shaming of those ousted officials, which their families also suffered, fewer people would want to join Mr. Duterte’s administration. A simple letter of removal would do, and if a graft case is warranted with court action, so be it---but not the public shaming, as in the first place, it doesn't make our President look good using such vile language. In addition, these officials have families, especially children who may be presumed to be innocent of what their parent is being accused of. Moreover, at times the case against the accused may not even be that solid. Interestingly, however, the President came down quite soft on Solicitor General Jose Calida, who, it turned out, had not divested of his business interest in the family-owned security company despite his appointment to government office. The Vigilant Investigative and Security Agency, Inc. (VISAI) is wholly owned by Sol-Gen Calida and his family and in answer to accusations about its having cornered some P160 million in contracts from various government agencies, its officials have stated that those contracts were won through competitive bidding. In addition, the agency released a statement stressing that the government’s top lawyer had quit his post as president and chair of VISAI a month before the President appointed him Solicitor General. News indicated that Calida's wife and son have taken over the top posts in VISAI. That may have been the case. The fact, however, that Mr. Calida has not yet divested of his shares in the family security agency and that it has bagged all those multi-million security contracts from various government offices would doubtless tempt ordinary citizens to conclude that those offices signed up with his family agency because he is the Sol-Gen.
As Albay Rep. Edcel Lagman pointed out, Calida should have divested himself of his interest in the security agency and not have allowed it to go after government contracts. In other words, it would appear that VISAI managed to get all those government security contracts because the Sol-Gen’s family owns the company. In the more advanced and politically developed countries such a set-up would not be possible. To top it all, soon after news of Calida’s family-owned security agency bagging many government contracts made headlines, Mr. Duterte immediately defended his top lawyer in media. He was quoted as stressing that he saw no reason to fire Calida as he had no participation in the operation of VISAI, having already “retired” from the company---even if it's a fact that Calida’s wife and children run it. What is curious is that there appears to be a double-standard being applied by the President in the case of Sol-Gen Calida’s family security agency, and the case of other administration officials who were fired in so public and vociferous a manner for alleged corruption. At the simplest level, it would appear that Mr. Duterte is grateful to Calida for having engineered the ouster of Chief Justice Ma. Lourdes Sereno when he introduced a new animal in the prosecution of impeachable officials---the quo warranto. This new concept facilitated the removal of CJ Sereno by a simple 8-6 vote of the Supreme Court and not through the foreseeable bloody impeachment process which could not promise her certain removal in a Senate trial. Doubtless, in Mr. Duterte’s reckoning, CJ Sereno had to go because she had dared to fight him on several issues. Interestingly, Sol-Gen Calida, in using the quo warranto to oust Sereno through the vote of her colleagues, had argued that she had no business staying at the High Court’s helm because her vote was void AB INITIO---from the beginning---on several grounds, such as her having failed her psychological test and her faulty SALNs. 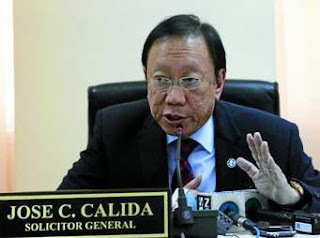 But I've heard lawyers opine that this very same argument could be thrown against Mr. Calida too---that he had no business ab initio, from the beginning, to be appointed as the government’s top lawyer, as he had failed to completely divest of his business connections in his family's security firm.